Ingredients: Pale two-row and Munich six-row barley, select grains, all imported hops and a pure cultured yeast strain. OH YEAH! We got a big one tonight. This is ranked number 5. No, not that number 5, this one this currently ranked number 5 of THE WORST BEERS IN THE WORLD. So why am I reviewing the fifth worst beer in the world? Well, my sister told me that she really liked it and gave me one to review. I must say it’s been in the beer fridge for a long time as I have been building up the nerve to give it a whirl. So last see how good the fifth worst beer in the world really is. 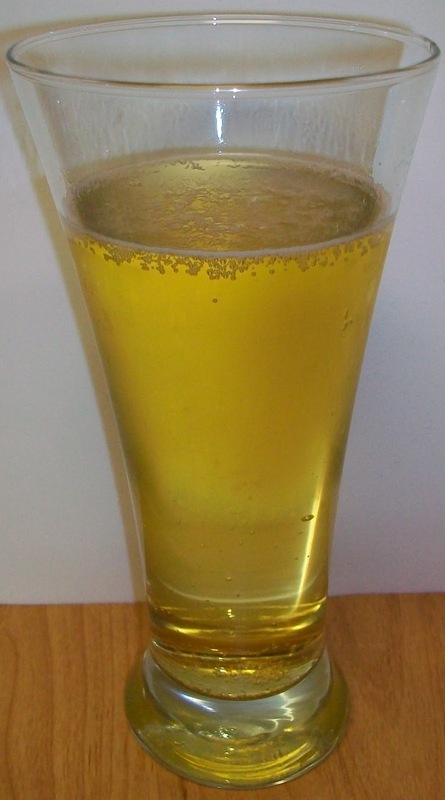 The beer pours a crystal clear pale straw color with a vanishing white head. This beer is highly carbonated with a tremendous amount of tiny bubbles rising up from the bottom of the glass. There are aromas on the nose; light pilsner type malt along with some grainy corn or rice notes and slight floral hops are also present on the nose. Wow, this is the most tasteless beer I’ve ever had. I really can’t say it’s bad because it really has no flavor. I’ll have to refer back to my first impression of the Bud Light/Miller Lite review to see if I had the same reaction to them. There is really no point in a play by play because there is not much of any experience to detail. There is really nothing up front then effervescence over the tongue. There is nothing on the back-end through the swallow that would give an indication of beer yet. There is a very slight, extremely light malt, I can’t even say flavor it’s just a hint of flavor on the finish. There is no aftertaste what so ever. I have never experienced this before. I described other light beers as training wheels for real beer. Keeping a similar analogy this would have to be a tricycle. I guess this has a place on an extremely hot day. I can see it being refreshing ice cold but I still think I’d rather have water or lemonade. We have warmed to 55 degrees. I must say it’s getting a little odd. There are definitely off flavors developing as this beer warms. We are only at 58 degrees and this is almost unbearable. I am really not a masochist so I’m going to kill this now. Boy that was a bad finish. I guess this own really has to be drunk ice cold. I’m not sure what’s appealing about this beer. It must be the low carbs of 2.6 grams or the 95 calories. It’s not the low alcohol because this beer has as much alcohol as Guinness stout at 4.2 ABV. The logic escapes me but I know this is a very popular light beer. If “light” is to mean light in alcohol then there are a tremendous amount of beers at 4.2% ABV that have really good flavor. If light is to mean light in color and flavor than why are people drinking beer at all. Sorry, I guess this is a topic for a separate style discussion post. 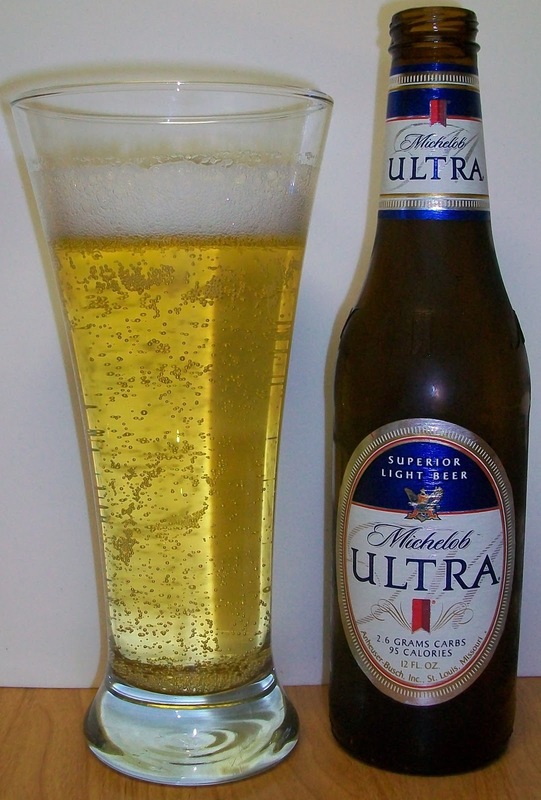 I haven’t rated any other light lagers so I’m not going to start now and good this for Michelob Ultra. This is the least beer tasting light beer I’ve ever had. There is not any real beer flavor cold and as it warms it’s just nasty. This beer has just the hint of flavor that a light beer has. So like I said earlier if light beers are like training wheels for real beer than this one is like riding a tricycle. So if tricycles are your thing this is the beverage for you. Well this one was a hoot, thanks Char! John years ago when I was on a low carb diet this beer hit the spot. Now that I am back on the diet and a little more beer savvy I have been looking for something for myself. As you know my favorite is the Leffe blond but that is about 17 grams of carbs. Way to high right now at the stage Im at in the diet. There is a web page that I found with carb counts. I wonder if you could test a beer that hovers under 7 grams to see what you think. First of all thanks for commenting and second I’m so glad to here that you are still drinking Leffe. One down just a few million more to convert. There is a reason beer is referred to a “Liquid Bread”. I assume that the carbs are hard to separate from the malt sugars that come from the grains like wheat, barley, rye, oats etc.. So it is not surprising that a low carb beer has no malt flavor. My first thought was to tell you to just count your next beer as a bread. I know several people that do that including some diabetics. However, did you ever try some of these new Gluten Free beers? Some of them are actually make by the big breweries. Redbridge is made by Anheuser-Busch InBev. I have not looked into the carb count for these but it they are not made with the typical grains that would give you gluten they are made from Sorghum. Of course I may not be connecting the dot’s correctly in thinking Gluten Free would be low carbs but it may. If you find something I would be glad to review it. They have the Redbridge at Total Wine maybe I’ll pick one up to review, just for the fun of it. I’m curious as to how it would taste. I'll look into it for Missy...there are several Sorghum beers made and/or sold in this vicinity. However, I don't think the gluten is the problem...that's actually a protein. Although, "New Grist" gluten-free beer, brewed with sorghum and rice is labeled as "low-carb." On a completely different note -- and taste. I'm just sipping a New Belgium offering labeled "TRIPPEL Ale Brewed with Coriander." This is a widely distributed label and thought you might want to comment. I wish I could comment on the New Belgium but we still don't get it around here. The last New Belgium I had was last year at your house. My normal resource in Maryland, State Line Liquors is adding a new distributor and I believe they will soon have New Belgium.